Bengalees loved Shyamal Mitra. From the '50s till the '70s he was probably the most popular male singer of Bengal besides Hemanta Mukherjee. Shyamal's voice had this wonderful romantic character and his songs are even after all these years, make one nostalgic. However, Saikat, his son, although does have a decent voice, decided to start his singing career by singing all his dad's songs in local concerts. This earned him money and many contracts, but unfortunately he couldn't establish his own identity. He managed to do some play back singing in the limited Bengali cinema and the TV. Salil used him on and off and did acknowledge once that Saikat is quite a good singer and needs good songs to prove himself. Well, I would definitely like to believe that. He recorded eight songs of Salil in a cassette released in 1990 by HMV. Some have been recorded before by other singers but there are some new compositions also. In one Doordarshan show he sang a Hindi version (Lyrics: Yogesh) of that beautiful Antara song 'Kono Bhaalo kobitaar'. Besides this he also sang in a Hindi TV Film/Serial called 'Charitraheen'. 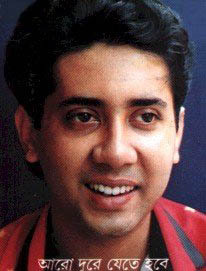 In 1990 as many as 4 albums of Salil were released. Unfortunately we didn't get many new compositions from Salil that year. Most of the songs have been recorded before by other singers or they were used in films. Fortunately we got a rather rare and excellent composition in Saikat's album and that is "tarpor jete jete", originally a poem written by Subhas Mukhopadhyay and set to music by Salil. The other delightful and intersesting composition is "koto naa kathaa chhilo bolbaar" with wonderful lyrics. Saikat also sang quite a difficult song 'Aar kichhu nei balaar' rather well. This song was originally recorded by Sabita, but I must say that I prefer Saikat's version. There are some tricky notes which he handles quite beautifully.